Collagen & Amino Acids STUDY - collagen, collagen supplement, hydrolyzed collagen protein, collagen amino acids, predigested collagen, collagen study research, liquid hydrolyzed collagen, rejuvenate nail, collagen bioresearch, organic collagen supplements, collagen drink. collagen amino acids, predigested collagen, collagen study research, liquid hydrolyzed collagen, rejuvenate nail. We asked women in their 20s to 50s to try out Amino Collagen. Skin problems such as "dryness", "reduction in tautness or bounce", and "dullness" can occur at any age. To what extent can Collagen and Amino Acids, taken continuously, change all these? Meiji Seika Health and Bioscience Institute conducted a survey, under Professor Takahashi's instructions and collaboration, and analyzed the subjects' skin condition after 6 weeks. Take 1 spoonful (attached spoon) of Amino Collagen once a day, and continue the usual skincare regimen for 6 weeks. 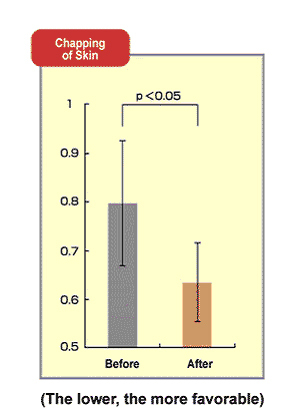 The moisture content in the upper arm improved from dry (35-50) to sufficiently moist (>50). The moisture content in the face increased for 72% of the subjects. 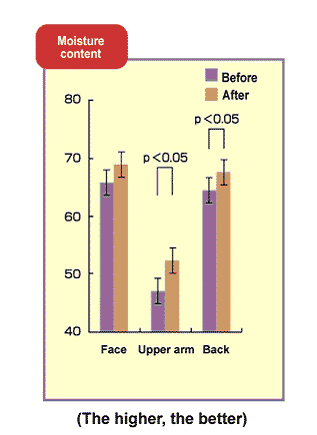 The rate of recovery of skin after pulling. The biological age of skin is calculated based on suppleness. 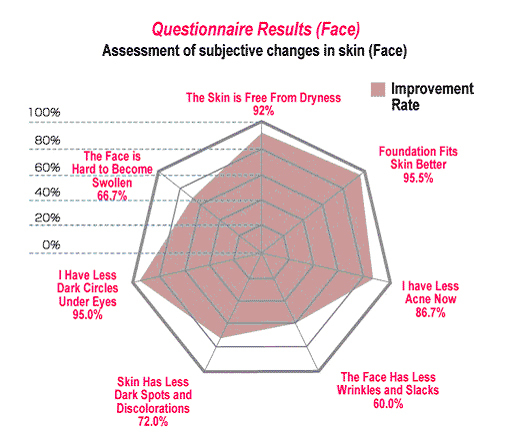 The age of the skin improved by around four, from 37.5 to 34. 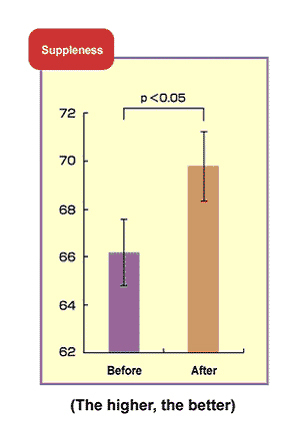 The values increased for 76% of the subjects. An indicator of the number and width of the wrinkles on the skin. The higher the number, the more wrinkles and the wider they are. The number decreased for 76% of the subjects. The numeric is calculated based on the brightness and darkness in a microscopic image of the surface of the skin. The higher the number, the coarser (rougher) the skin. The lower the number, the smoother (more radiant) the skin. The numeric dropped for 72% of the subjects.